(cells are on top of each other) or have so-called "indent layout" (cells are arranged horizontally but if a line is too long it is wrapped like text to the next line, with indent before each next line). Collection cells can also specify a Context assistant , which will provide intuitive visual actions to the user. Check out the Context assistant documentation for details. Used mainly to show reference targets. The main difference between a referent cell and a child cell is that we don't need, or don't want, to show the whole editor for a reference target. For example, when a certain node, say, a class type, has a reference to a java class, we don't want to show the whole editor for that class with its methods, fields, and so on; we just want to show its name. Therefore child cells cannot be used for such a purpose. One should use referent cells. Each cell model has some appearance settings that determine the cell's presentation. They are, for instance, font color, font style, whether a cell is selectable, and some others. Those settings are combined into an entity called stylesheet. A stylesheet could be either inline, i.e. be described together with a particular cell model, or it could be declared separately and used in many cell models. Both inline stylesheet and style reference are specified for each cell in its Inspector View . It is a good practice to declare a few stylesheets for different purposes. Another good practice is to have a style guideline in mind when developing an editor for your language, as well as when developing extensions for your language. For example, in BaseLanguage there are styles for keywords (applied to those constant cells in the BaseLanguage editor, which correspond to keywords in Java), static fields (applied to static field declarations and static field references), instance fields, numeric literals, string literals, and so forth. When developing an extension to BaseLanguage , you should apply keyword style to new keywords, field style to new types of fields, and so forth. 読み取り専用 - whether one can modify the cell and the nested cells or not. 偽 by default. Designed for freezing fragments of cell tree. スタイル - can be either plain, bold, italic, or bold italic. While some style properties affect only the cell to which they are applied, values of other properties are pushed down the cell subtree (nested cells) and applied to them until some of the child cells specifies its own value for the property. Such inheritable properties that are pushed down the cell hierarchy include text-foreground-color , text-background-color , background-color , font-style , font-size and many others. If both style classes are low-level , the value pushed from parent will be ignored and replaced with value from style class of current cell. For example, a comment containing the word TODO should be styled more prominently then a plain comment. Thus the language concept representing a comment needs to apply a TODO-aware style ( TODO_Style ), which declares its dominance over a plain Comment_Style . The actual styling properties are, however, only applied if the comment really contains the TODO text (isToDo()), otherwise the plain Comment_Style properties are used. The SELECT_ALL action, which selects the whole contents of the editor and is triggered by Control/Cmd + A , can also be customised through action maps. The jetbrains.mps.nodeEditor.selection.SelectUpUtil class with executeWhile method can be leveraged to specify an upper selection boundary for this action. Actions defined in the current cell action map have priority over actions defined in any of the imported cell action maps. If multiple imported maps define an action of the same type, the most recently imported one takes precedence. Cyclic imports are not allowed. The applicable concept of any imported cell action map has to be the same concept or a super-concept of the applicable concept of this map. Action map imports work cross-language: an action map in the editor aspect of one language can import an action map from the editor aspect of another language. The DELETE and BACKSPACE action handlers have specific semantics. If an action map defines or imports a DELETE handler and does not define or import a BACKSPACE handler, a default BACKSPACE handler identical to the one for DELETE is registered automatically. The resolution of imported action handlers is dynamic (happens at run-time. When action map A imports items from action map B, the exact action handlers that will be registered are not resolved at generation time of action map A. Instead, code is generated that will register handlers provided by action map B at runtime. As a result, action map A does not have to be regenerated when action map B changes. This functionality was previously achieved through 制約 . In projectional editor it is sometimes hard to predict what part of the code will be deleted when you press 削除 or バックスペース . For example, when the caret is on the semicolon of the baseLanguage statement and you press バックスペース , the whole statement will be deleted. With two step deletion, you now can see what part of the code which will be deleted. Here how it works: you press 削除 or バックスペース and the part of the code, which is to be deleted, becomes highlighted. If it suits you, you press 削除 or バックスペース again and the code will be deleted. If after highlighting you realize that you don't want to delete this piece of code you can press エスケープ or just move the caret and the highlighting will disappear. Press バックスペース . The whole statement is highlighted. This means that if you press バックスペース again, the statement will be deleted. Press バックスペース again. The statement is deleted. Let's see an example scenario: we press delete on the "final" keyword on the IncompleteMemberDeclaration . There is a custom action, which sets the final property to false. In the editor, there is the cell, which is shown only if the final property of the node is true, so after the action, the cell wouldn't be shown. The language designers can set the style and the priority for the items in a completion menu. In order to do so the language designer should create the Completion Styling root in the editor aspect of the language. In order to specify the style of a completion menu item the language designer should first specify the item. Items which create instances of a specific concept. Those are mainly the substitute actions. For example, when user selects the ReturnStatement which is in the StatementList and presses コントロール+スペース , the items in the completion menu are creating the instances of ステートメント and replace the ReturnStatement with those instances. So the selector for actions creating instances of ステートメント will select those items. Once the selector matches a menu item, the language designer could customize it's style. The style object serves this purpose. If at least one styler sets any of the bold/italic/hide styles, the item will be bold/italic/hidden. If the background or the text colors conflict, the first one specified will be used. The priorities are used to sort the items. The biggest value set as a priority for an item by the stylers is used. Items are first sorted by priorities and then by the level of matching the user's text. Currently there is no way to override this level. There are several parameters the language designer can use. They are stored in the item. matchingText - the text appearing on the left side of the item. This text is used to filter the items when the user types the text in the completion menu. descriptionText - the text appearing on the right side of the item. parameterObject - some of the items can be parameterized with an object. For example, items which change the node's reference are parameterized with the target of the reference which they will set when executed. outputConcept - some actions, like substitute actions create new nodes, the output concept is the concept of the new node. ReturnStatementStyling which makes a return item bold and sets its priority to non-zero, if it is last in the current statement list. 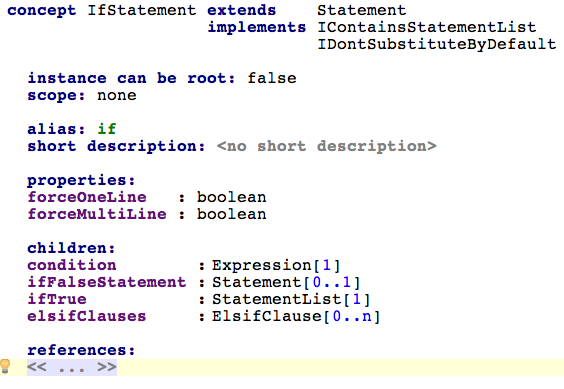 VariableReferencePriority which sets the items priority to non-zero if the item references a variable declaration.